For the non uniform systems, modeling strategy was to devide the system into number of subsystems (one subsystem is an ideal CSTR), as i also did in Fixed bed adsorption coulmn for Bodec. The strategy which you are discussing in this blog is same or different? Nice to see your comments about the blog! This strategy is different, and the difference is that using this strategy you account for time & one or more spatial coordinates as independent variables in your model! What this means is that you can calculate what the profiles of system quantities will look like with respect to time and (defined) space coordinates of your system, i.e. its geometry. 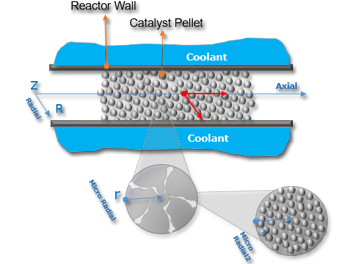 Then you can make important decisions like what the optimal reactor diameter and length should be, or the optimal catalyst pellet geometry characteristic. If you use cascade of a lumped systems (as you did in your project) to represent a non-uniform system, you can simulate very well the behavior of the real existing system, by tuning the number of subsystems and other model parameters. But in that case, the time is only independent variable, and no space (system geometry) characteristics are accounted for except the system volume value used to quantify the system. Depending of the model goal or the real case system (unit) characteristics you could neglect the spatial coordinates, and assume that each of your subsystems is uniform over its entire volume. But if the real case system can not be assumed to have uniform properties over its length and radius, and the model goal is the design of such a unit then you must account the spatial coordinates of your system in your model. This is where space discretization methods are employed. Stay tuned, in the following blogs we’ll explain how this strategy is implemented in Mobatec Modeller, and what are the benefits of that approach! • You stated that Mobatec Modeller uses the method of lines approach – why is this preferred over the other option? • Similarly, I’m curious why the finite difference method is preferred over FVM, FEM and the spectral methods. Does that have to do with the ease of defining the problem? Computational advantages? • Method of lines is selected from two main reasons. First is very practical – MM already has a time integration (ODE) solver (semi-implicit Euler), so by making use of MOL approach which in fact is a “manual” space discretization which employees the existing solver ODE solver. Second reason is also practical, that is when MOL approach is used you do not have to worry about the time integration and stability. • This one requires a “bit” more analysis to explain fully, but the answer becomes more simple if we narrow our solution target field. In chemical engineering 99% of the cases, we want to solve 1D e.g. axial, or 2D e.g. axial-radial profiles prr the combinations. These are always “rectangular” domains and very much suitable for FDM, while FEM can handle irregular “shapes”. Other and main reason is that we often “want” a large number of discretization points over the defined domain and for that reason the FDM is the easiest to implement and much more less demanding when it comes to computational effort needed. • Examples of FD methods correct application will indeed come in one of the next blogs. The idea behind explaining the properties of each method is that the user can be able to decide which method is most suitable for each variable calculation depending of the case at hand. In gPROMS or ACM, you cannot assess the numerical method structure, it’s a black box. It is easier like that indeed, BUT your hands are tied together when it comes to model convergence problems. The biggest difference between MM and other software is in its flexibility. In MM you define the FD method and its physical mathematical topology structure by yourself, and you can decide even which method you want to use for which variable, and you can dynamically change the length of the distributed domains while the model is running. I can report to you that we did the comparison testing solving the very same models in MM and gPROMS, and have achieved better and higher convergence rate by high margin. The main reason responsible for this result is open numerical structure, for formulating the most suited “numerical boundary condition” of each distributed domain for the FD method used, the use of so called “mixed fluxes numerical boundary condition”. No coding knowledge or experience is required to do any of this in MM. This will also be elaborated in one of the next blogs. Previous PostPrevious Introducing “Real Reality” in Operator Training: Field Operator also involved in Simulator Training!